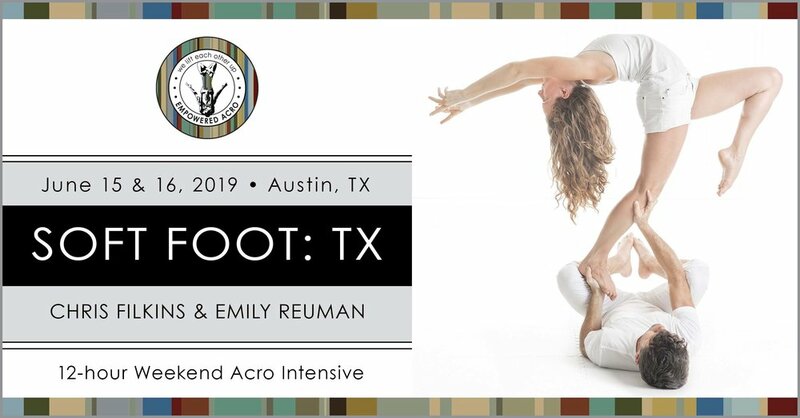 Soft Foot: Chris Filkins and Emily Reuman lead an acroyoga Intensive hosted by Empowered Acro in Austin, Texas. June 15-16, 2019. Once upon a time, a wee flyer named Emily thought that painful acro was all part of the fun. It was the price to be paid for the joy of inversion and getting high in the air. But there was another way! Chris brought her to the light. In this teaching partnership, Emily & Chris aim to bring comfortable, joyous play to the masses. • Soft Feet - soften up the pointiest feet to bring smoothness and comfort to your play. • Tipping Point - utilize fulcrums to direct the flow of movement. • Spin - explore the edges of dynamic movement by rendering its predictability. • Balance - fine tune alignment and precision in yoga-slacker type exploration. • Strong Flyer - flyers run the world, bases are just there to look pretty. • Flow - deploy your newfound skills to enjoy the limitless joy and satisfaction of flow. Since 2015, this partnership has built and shared teachings at weekly classes, workshops, and events including the AcroLove Festivals, Vancouver Acro Festival, Ignite Fire Conference, Burning Man. Upcoming workshops include AcroLove World and CAMP Camp Costa Rica. Chris leads Westside Acro, the longest running acro series in Southern California. Chris comes from an extensive background in gymnastics, ballet, calisthenics, clowning & circus arts. He began teaching as a teenager and has decades of experience providing a safe environment to share highly technical movement patterns. His efforts at promoting safety & consent in partner modalities are known throughout the practice and his students have gone on to become some of the leading teachers in the practice. From breakdancing to ballet, Emily’s acro abilities developed through experience from across the movement spectrum over the past three decades. Originating from the Philly scene, she came to acro through her dance, Ashtanga yoga, and flow movement background. Emily has led acro classes and workshops across the country since 2014. She is certified to teach through the school of her movement research and the hundreds of students who have worked with her. While both Emily & Chris love teaching solo both as a base and flyers, everyone seems to love the spark of creativity, comedy, and fun that arises from their deeply skilled and grounded technical chops when teaching. Join us to have fun, sweat, and get deep into acro!